Republican Matt Shea of Spokane Valley has a talent for doing the offensive. His behaviors range from making his ex-wife walk down the sidewalk in a submissive position to him to pulling an illegal handgun on a motorist during a road rage incident of his. 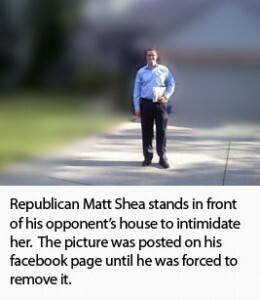 Matt Shea has violated restraining orders from his ex-wife and traveled to his opponent’s house to intimidate her.